Thanks for tuning in again to Angela’s contribution here at Heads Shoulders Knees. 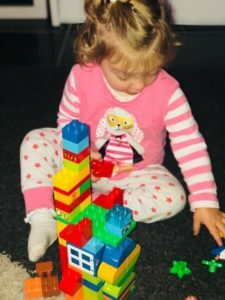 Here is Part 2 of her piece on early learning and play! 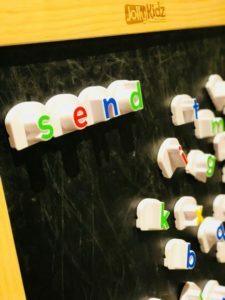 In this article she gives some wonderful examples of fun the activities you can do with your children at home. They are all easy peasy, and with limited prep! Perfecto! It’s a handy list to keep up your sleeve for those rainy days! Remember not to pressure your child, you want to make this fun. If you feel that the child is getting frustrated with the question or isn’t engaged then just let them play and enjoy it. 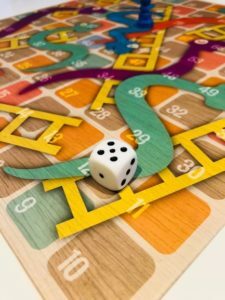 This is a fun and simple board game for children aged 3 and up (although it is suggested for older children, with supervision, I believe this can be used earlier). This board game can teach turn taking, one to one correspondence (counting the number on the dice) and number recognition. Can you count the dots on the dice? Whose turn is it now? What number did you land on? *Do not expect your child to know all the numbers. Especially numbers over 10. However, they may be able to tell you they can see a 3 in 30. Then you can tell them the number is 30. Which way do we need to move our marker? *This may be difficult to understand but asking the question each time and briefly explaining why it goes that way will support their learning. This is another great game that helps a child practise their counting and number recognition. 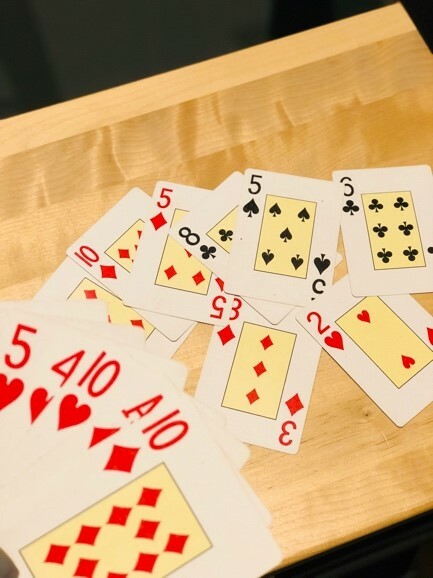 We play Go Fish as an open hand, meaning that we lay our cards face up on the table. This means we can have conversations during the game and help Cristian work out which card to use. You can play any version or variation of Snap or Go Fish. The main focus is counting the images on the card and being able to match them. Can you count the number of *hearts*? Can you find another card with the same number? How do you know that is a pair? Is that number bigger or small than **? Can you recognise the number (digits) without counting the pictures? These allow you to practise so many different skills but can be more exciting and engaging than pencil and paper. As well as fine motor skills and pencil grip there are a range of different ways to use these. Blocks are such a fun activity for children. They are also a great teaching tool. Using blocks to build allows children to practise their fine motor skills as well as use their imagination to create something from scratch. Creating patterns – What colours am I pointing to? Can you match the same pattern as me? Can you make the pattern go longer? How did you know what comes next? If you have these, it is a great idea to have them on your fridge or somewhere they can be accessed often. You will be amazed at what a child can learn from constant exposure. If your children, like mine, enjoy hanging out in the kitchen while you’re cooking, then these will also be a life saver for you. Can you put the numbers/letters in order? Children listening to books and having conversations based on the events, setting, characters etc. We hope these two articles have given you a clearer insight into how wonderful PLAY can be for learning. 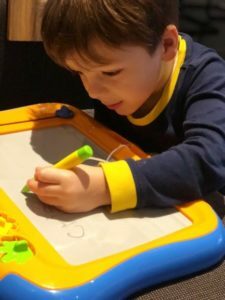 These activity odeas are easy ways to engage your child and keep them learning without even realising! Win! Please let us know what you think by commenting below or emailing either of us!